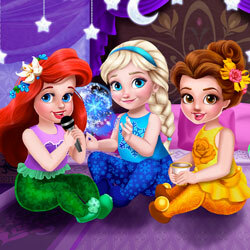 Description: Your favorite little princesses are having a sleepover party! Pick which bedroom they should all be in, and decorate it. Then, choose the perfect hairstyles and outfits for each of them. With the prep complete, it's time to party - a spot of tea, wondrous ice-magic, some karaoke and let's not forget to take some pictures to remember this awesome slumber party!